Ah, the Chinese wedding car. I haven't seen one for weeks - presumably san fu's stinking weather means it's off-season for weddings in August. But now at the tail end of the month the temperature has dropped to a practically chilly 35 degrees and only 91% humidity, which means weddings are starting to crop up all over the place. 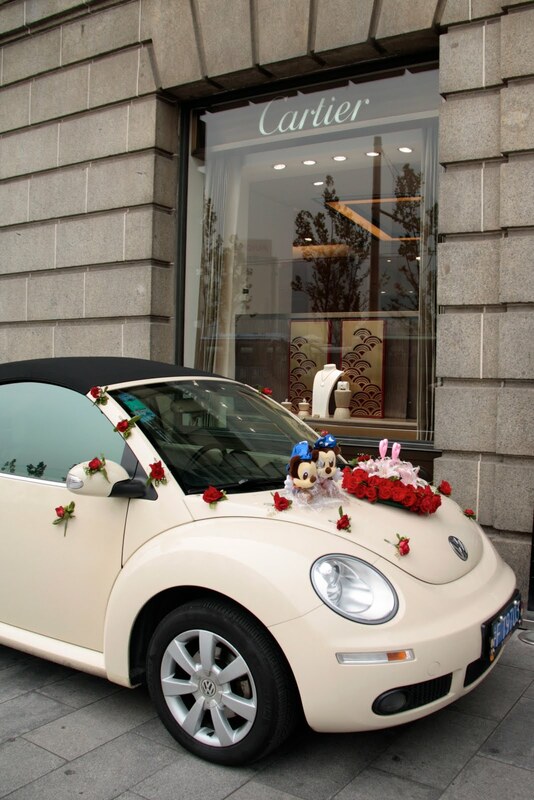 This wedding car was parked on the Bund yesterday, on the footpath, right outside Cartier. I don't know why there weren't parking cops or Cartier doormen all over it like a rash, hauling them newlyweds off to parking hell. Perhaps the wedding was being held inside the store? The rest of the entourage cars were parked nearby in an alleyway, all six of them. In China, the number of cars in the wedding entourage gives people an indication of your status, so seven cars = pretty well-off, but certainly not rich enough to afford anything at Cartier. Odd numbers are good. Avoid four cars, because the word for four sounds like the word for death. Not auspicious. Anything more than eleven cars is getting into serious status territory - filthy rich, or high up in the Party, or both. Luckily, the cars don't need to be matching, so you can call up all your mates and have them sticky-tape roses to the car doors and meet you en route. One wedding car rule is set in stone - the lead car must be different from the others, and it must have a wedding pair of stuffed Disney characters stuck to the bonnet, plus a heart-shaped floral arrangement and a special wedding themed license plate cover. Hello Kitty pairs are okay, but only if one of you is Taiwanese, or if the shop has sold out of Mickey, Minnie, Donald, Daisy and Goofy.